The EA6300v1 and EA6400 are currently the same product. This review applies to both. Linksys has stumbled in the rollout of its first router under Belkin ownership. But their misstep is your gain, since you're getting the potential (with the appropriate wireless adapter) of the fastest draft 802.11ac 1300 Mbps link rate in the 5 GHz band instead of the advertised 867 Mbps. I have learned that this advantage isn't going to be permanent, however. Linksys is working on a firmware that will limit the highest 5 GHz link rate to 867 Mbps and turn the EA6300 into the AC1200 router it is supposed to be. There is no timeframe for the firmware's release as I write this. But if you want to keep the EA6300 as an AC1600 router, you might want to make sure that the automatic firmware upgrade feature is disabled. Now, on to the review. 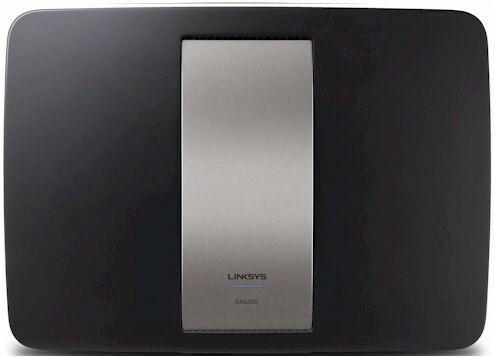 Linksys has continued the look and feel of the EA6500 and other EA series routers in the 6300's product box and physical design. In fact, you could easily mistake the EA6300 for the EA6500 since it is the same size. There is only a subtle change in the top panel indicator light (a thin green bar vs. the brighly-lit "Cisco" logo) and the different model number to differentiate the two. Yes, my review sample product box and router still carried the Cisco logo; I guess it will take awhile for the purge to propagate through everything. The 6300's rear panel above is a dead giveaway, though, since it moves ports around and has only one USB 3.0 port vs. the two USB 2.0 ports on the EA6500 shown below. Like the EA6500, the EA6300 is designed to sit flat on a table or desk. If you want to hang it in a wall, there are mounting slots on the bottom side. But they are at the left side of the router, so it will hang with all connections pointing right. There is a user manual posted on the EA6300's support page. It describes the router admin screen features, but is pretty short on details for the SMARTer features like Parental Controls and Media Prioritization. I've covered the EA6300's innards in my earlier article, so this is just a quick recap. There are five Galtronics bent-metal internal antennas, three for the 5 GHz radio and two for the 2.4 GHz. Looking at the front of the router (photo top), the 5 GHz antennas are positioned left, center and right (black cabling). The 2.4 GHz antennas (grey cabling) are positioned in the left front corner and left side rear of the router. Unlike first-generation draft ac routers like the Buffalo WZR-D1800H / WLI-H4-D1300 and NETGEAR R6300, both of the EA6300's radios are integrated right into the main board. Note the shielding for the USB 3.0 connector. This must be an effort to reduce interference with 2.4 GHz operation as described in this Intel white paper. Table 1 summarizes the key components in the EA6300 and EA6500 for comparison. The EA6300's feature set is essentially unchanged from its "SMART" predecessors. Part 1 of the EA6500 review has all the details. Signing up for a SMART Wi-Fi account remains purely optional. You have access to all router admin features via a the "local access" link shown in the screenshot below. Table 2 has a summary of the wireless settings for your reference. Routing performance for the EA6300 using our standard test method is summarized in Table 3, along with the EA6500. The results show that the EA6300 has higher throughput than the higher-priced EA6500, which is based on Broadcom's last-generation single-core BCM4706 router SoC. The EA6300's dual-core CPU brings more processing power to bear and, at least for wired routing throughput, it shows. The difference in Maximum Simultaneous Connections results isn't significant; both represent hitting the limit of our current test process. The IxChariot plot for the routing tests shows generally stable throughput, but with a few pronounced dips. Throughput is evenly split between up and downlink in the simultaneous up/down test. I ran Windows filecopy tests using the standard NAS testbed to the EA6300 with our USB standard drive (Startech USB 3.0 eSATA to SATA Hard Drive Docking Station (SATDOCKU3SEF) containing a WD Velociraptor WD3000HLFS 300 GB drive) formatted in FAT32 and NTFS. The results are summarized in Table 4, along with other draft AC routers and the current N-based leader, NETGEAR's WNDR4700 CENTRIA. Results show another benefit to using Broadcom's new dual-core BCM4708 processor, i.e. around a 2X throughput improvement over the EA6500 in all benchmarks except NTFS write. The EA6300 is still no match for the NETGEAR CENTRIA, however. The EA6300 is Wi-Fi Certified and defaults to Auto channel selection and the same SSID ("Linksys" + last 5 Serial # digits) on both radios. The 2.4 GHz radio is set to Auto Channel width and the 5 GHz radio comes ready for draft 802.11ac with a 80 MHz channel width setting. WiFi Protected Setup (WPS) comes enabled and prompted to enter the router's PIN and a new SSID, which it applied to both radios along with a self-generated sufficiently-strong password to complete a WPA2/AES secured connection. I had to change the SSIDs to unique values so that I could tell the bands apart. I ran 40 MHz Coexistence and Fat channel intolerant tests to see if the EA6300 properly refrained from switching into 40 MHz bandwidth mode. The router passed both tests, staying in 20 MHz bandwidth mode when a test client had its Fat Channel Intolerant bit set. It also switched to 20 MHz mode when I set the EA6300's channel to 8 and had an idle neighboring network on channel 11. Moving the EA6300 to channel 7 properly brought back 40 MHz link rates (> 130 Mbps). 1.1.39.149770 firmware was loaded for all testing, which was done using the new Revision 7 process. The new process uses ASUS' PCE-AC66 AC1750 PCIe adapter to test all wireless routers and APs. The EA6300 was tested in 20 MHz mode only in the 2.4 GHz band and 80 MHz mode in the 5 GHz band. The router was reset to factory defaults and Channel 6 was set for 2.4 GHz and Channel 153 for 5 GHz. The test client was connected using WPA2/AES encryption. The router antennas were positioned 8" from the test chamber antennas in the "0°" test position. The retest Benchmark Summary below shows the Consolidated benchmark process results. Remember that the summary shows the average of throughput measurements made in all test locations. The new process lets us see how throughput varies over a wide range of signal levels. Rather than show you the plots for just the EA6300, I'm going to show plots comparing data from the EA6500 retest with the EA6300. Here's what the plot looks like for 2.4 GHz, downlink (router to client ). The four values entered into the Charts database that correspond to Locations A, C, D and F are highlighted. This isn't really a fair comparison, because the EA6500's radio is an N450 class (3x3) and the EA6300's is only N300 (2x2). But it's surprising how similar the curves are. The EA6300's best 20 MHz mode downlink throughput was 89 Mbps. The 2.4 GHz uplink plot is next. The values are very similar to downlink, unlike the previous method, which seemed to favor uplink. Best case uplink throughput for the EA6300 was a bit lower then downlink at 80 Mbps. Simultaneous uplink/downlink throughput in the strongest signal "Location A" (or with 0 dB attenuation) came in at 110 Mbps total throughput. Moving along, the 5 GHz tests can be directly compared, since both radios are AC1300 class. Best case 5 GHz downlink throughput of 333 Mbps with 0 dB attenuation ("Location A") edged out the retested EA6500 at 313 Mbps. The curves show that the two products are very similar in 5 GHz performance. The 5 GHz uplink plot again shows the EA6300 with better throughput at 260 Mbps. The EA6500's 209 Mbps peak "Location A" throughput forms a wider gap than with downlink. Simultaneous uplink/downlink throughput in the strongest signal "Location A" (or with 0 dB attenuation) came in at an impressive 605 Mbps total throughput. This is almost 25% higher than the 491 Mbps for the retested EA6500 measured. Time for a few IxChariot plots. Here's a composite 5 GHz up and downlink plot with 0 dB attenutation. The delayed throughput upshift that seems to be a signature of Broadcom's draft 11ac technology is clearly shown. No sign of the upshift in the equivalent 2.4 GHz composite plot shown below. The EA6300 is our first look at a product based on Broadcom's dual-core BCM4708. It shows higher wired routing throughput and generally about double the performance for reading and writing files to an attached USB 3.0 drive compared to the EA6500, which is based on the single-core BCM4706. To be fair, some of the file storage performance can be due to the 6300's USB 3.0 port vs. the 6500's USB 2.0. Still, the gains are impressive and will be welcome to those of us looking for our router to also be a storage hub. The EA6300's 5 GHz wireless throughput compared to the top-of-line EA6500 is almost the same running downlink and significantly better at higher signal levels running uplink. This is probably to be expected, given that they both use the same Broadcom BCM4360 radio and both use outboard 5 GHz amplifiers. 2.4 GHz throughput, however, can never be as high as the EA6500's because the 6300 has only an N300 class radio vs. the 6500's N450. Because of this, the EA6500 should still produce higher throughput at all signal levels than the EA6300 when used with an N450 class adapter, although that difference will probably be hard to see toward the range limits. In all, though, I'd say that the EA6300 is a much better deal than the EA6500. As I write this, Amazon is selling the EA6300 for $127 vs. around $180 for the EA6500. But if your heart is set on achieving the higher 2.4 GHz link rates that the EA6500 provides, you could opt for a EA6500 Linksys factory refurb for only $150. Remember, though, that Linksys only promised that the EA6300 would be an AC1600 router. So when the firmware comes out that makes it so, don't complain. We'll be retesting the EA6300 when that firmware becomes available to see how much throughput you lose by being limited to the lower 867 Mbps maximum link rate.